I just attempted to complete #71 on my 101 in 1001 list: sand and paint the unfinished wall in the office. Okay, it’s not really an unfinished wall, but when we had a ceiling fan installed a while ago (definitely NOT a DIY project!) they had to cut big holes in the wall to do the wiring. 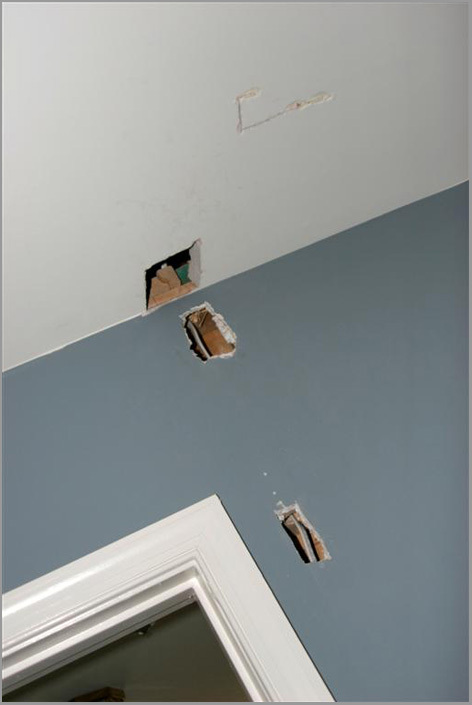 I used Home Depot for the job, and their contractors didn’t repair the holes that they created. They said that was someone else’s job?! But I figured it can’t be that hard, so I attempted it on my own. First, I bought some of those drywall patch repair kits, you know the little metal squares on a mesh backing? I was able to successfully apply those to the holes. That was the easy part – you just peel the sticker back off of the mesh and place it on the wall. Technically at this point the hole was gone and I was feeling pretty pleased with myself! However, I then had to wield one of those spatula thingies to apply spackle (the name escapes me at the moment – is it just called spatula?). Well, I’m not a spackling expert, and I applied it a little too thick. Which meant I needed to sand it down. My friend, Sam, who is a home DIY expert warned me that sanding it would get dust everywhere and that I should wipe away the excess with a damp cloth or something. I can’t remember. So I have thus confirmed that information by ignoring her warning and sanding down the little mounds of spackle. Yes, everything in my office is covered with a fine sprinkling of white powder indeed. Lovely! Not to mention I can’t seem to get the wall smooth – there are nice little holes and lines all over that refuse to go smooth. Then, in the process of painting over the spackle, I grew tired and frustrated and did a sloppy job of painting. I ended up flicking little spots paint all over the carpet. Note: This will be the comedic part of the episode, as my painting skills are definitely hilarious. I was using a paint brush to put paint onto a roller because I didn’t want to go through the hassle of using a tray and a liner. I’m currently working on getting the paint up by using Goo Gone. It seems to be sort of working.I think I’m probably going to have to hire someone to come out and get the wall done the way it should be finished. I don’t even want to attempt to finish the ceiling. If anyone local to me knows someone who does a great job with painting and repairing holes in drywall, please send me their contact info! And then maybe I’ll close out the episode by saying something like, “Thanks for tuning in to Don’t DIY! I’m Susan, and remember…if you don’t DIY, you don’t have to worry about screwing up!” What do you think? Would you tune in? I also have an idea for a how-not-to-cook show. I might call it Making a Mess and Burning Things with Susan. Sorry it’s gone all wrong. What about asking the friend who told you about the sanding to help? It’s worth a shot. marlene - I would totally be on the segment entitled ‘Don’t DIY Red Velvet Cupcakes.’ My kitchen looks like a crime scene that the culprit couldn’t quite get clean enough. Eileen Broderick - Ok–bummer–I totally commented from work today (and listed, like 5 movies for you to watch!) but they wouldn’t go through! I think it’s some security issue. Damn internet security!